I've been focusing on the exterior work, including propane, plumbing and electric. Lots of stuff in progress, but I've finally completed the alternator charging circuit. Almost all of my materials came from the AM Solar 230A Alternator Charger Kit (Drop in Lithium). I did substitute for a panel mount breaker and 5/16 lugs rather than 3/8 lugs. The hall sensor is here. Remove the drivers seat, battery box, and panel cover. 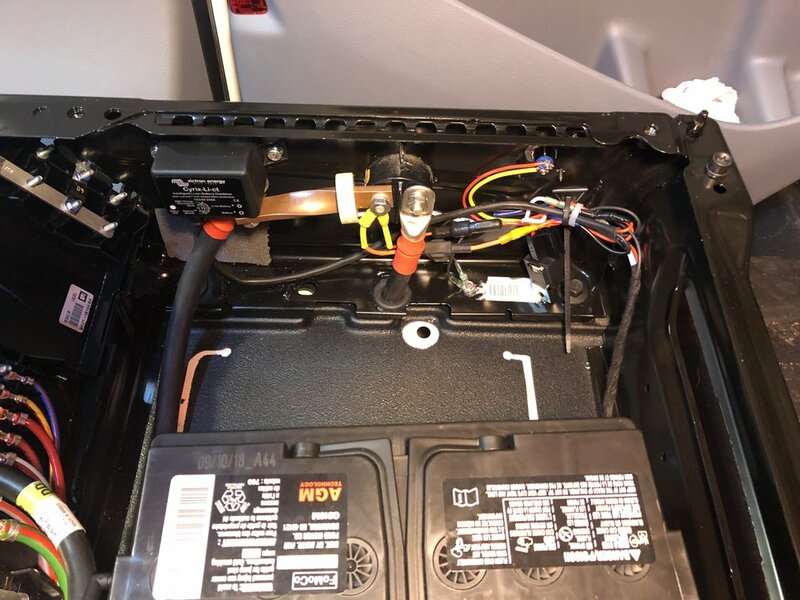 Decide where to put the Victron Cyrix-ct-li unit, 200 Amp breaker, and associated wiring. The only real space was to the left of the battery box but it would be tight. Install a 4/0 cable from as close to the Ford alternator circuit as I could get to the Cyrix unit. To do this I removed the busbar connecting the alternator to the panel, and drilled a 5/16" hole. I had to grind out a bit of plastic underneath the busbar to make room for the head of my new bolt. Bolt the Cyrix unit to the left side of the seat base. With a 4/0 lug on the stud, I needed to add some clearance to prevent the lug from potentially grounding out on the seat base, so I put some 1/8 inch foam between the unit and the seat base. Because of the tight spaces, I used a .25” x .75” copper busbar instead of a cable to connect the Cyrix unit to the 200A breaker. 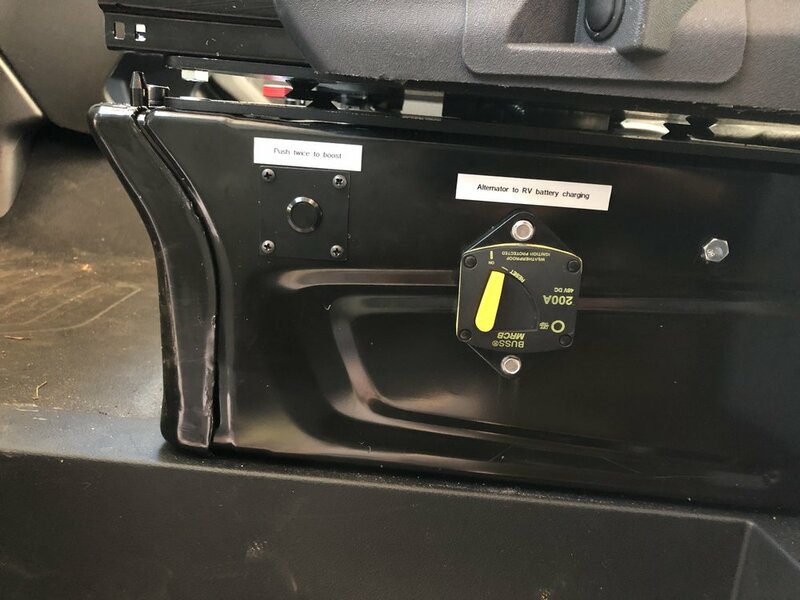 It's a panel mount breaker accessible from the outside of the drivers seat base. Drill a hole through the floor at the forward left corner inside the seat base for the 4/0 cable run. Run the cable from the seat base along the main left side front/back frame, above the spare tire, over the tailpipe (with some heat shield in place), and up into the 4” access hole in the right rear corner. I used a mix of ¼” plusnuts and 8mm bolts, with stainless steel clamps along the way. The entire cable is sheathed in polyethylene split loom with grommets where it passes through metal. 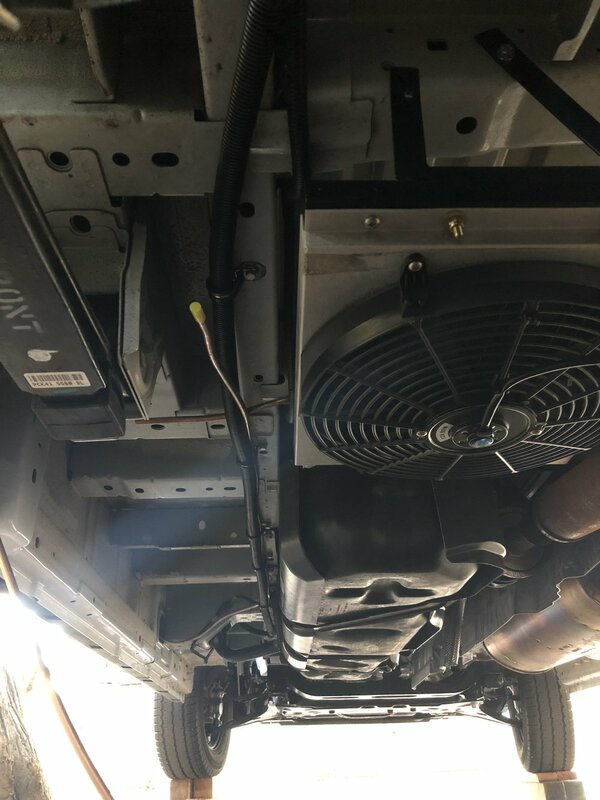 The access hole underneath the vehicle leads into the D pillar, but there is a a 1" x 3" slot that allows access to the D pillar from the van wall. This is with the house bank at 40% state of charge, and the starter battery down to 11.7 V. So far the Cyrix unit has performed flawlessly – combining the batteries whenever a charging voltage is detected, and disconnecting them when the charging voltage goes away. My alternator will push a maximum of 14.4 volts, so I cannot overcharge the Lithium bank. The unit has a starter boost feature – by pushing a button twice the batteries are combined for 30 seconds even if no charging voltage is detected on either side. This allows me to recover from a dead starter battery by using the house bank, but prevents overcharging of the starter battery. I will still need to test its behavior when the inverter charging function is enabled. Overall I'm happy with how it turned out. Good performance from the alternator, minimal space used for the install. I'll be curious to see what Ford thinks of my mod if I have a warranty issue with the electrical system. Let's hope I don't have to find out. One of the photos shows the cable entering that rear access hole. I also wired up my 30A shore power service and external solar panel jack in the same location, fabricating an aluminum panel to hold it all in place. The solar panel and 30A service are in their own conduit. Another photo shows the wire run underneath the vehicle. That fan housing is the condenser for the CruiseNComfort AC. Install still in progress. Two studs secure this busbar. I remove the studs, drilled a 5/16 inch hole in the middle, inserted my own 5/16 inch bolt, trimmed away plastic to make room for the bolt head, then reinstalled the busbar. Ground wire stud with ground wires for the Victron relay and the Bosch style relay. Hit the switch twice, and the house bank will be combined with the starter bank. Useful if the starter battery is dead and you need a jump. The breaker is used to disable the charging system entirely. I had to install it upside down, no room the other way. I removed the existing plastic cover over this opening and fabricated an aluminum plate to hold the cable, my shore power charging port, and my auxiliary solar panel connection port. Uh oh, 221 amps to batteries! 221 A to my batteries +40 A for the van means the alternator was putting out 261 A at this moment. Over its rated capacity. However, this problem mysteriously went away, and has not returned even after repeated experimentation with varying states of charge of both banks.